The 6-week Meditation Course is an excellent program to learn how to meditate for beginners and also for the astute meditator that desires to go deeper and find more in their meditations. You can do it from the comfort of your own home and plan it into your schedule when it suits you. 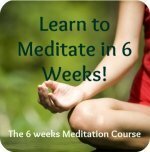 Book Your 6-week Meditation Course Now! We are 100% committed to you succeeding with your meditation practice. If you have followed the course and done your best and are not happy, we will give you your money back minus a $25 admin-fee. We are happy to say, if this happens, you will be the first! Meditation is easy to learn with this meditation course but it may be hard to practice on a regular basis if you haven't gotten to the depth where you will start to reap great benefits. When beginning meditation people often find that they need some kind of course or retreat to really “break through” and discover what meditation can offer.The 6-week Meditation Course is perfect for that. The mechanics of meditation as you are being guided by experts in the field. Many forms, tools and techniques of going within. How to calm your mind and take control over your emotions and thus take control over your life. How to increase the feeling of peace, calm and happiness in your life. How to connect to the Source and live your live from your connection. The main obstacles re. meditation and how to overcome them. How to find access to the discipline that lives inside of you so you can succeed in making it a practice that fits into your daily life. How to tackle challenges in your life and find the answers / solutions fast through meditation. Video's by Rose, your guide who will take you step for step through the 6 classes. Guided Meditations, where you will be guided into your meditations. Talks that will give you all the teachings and principles you need to learn the meditation practice. The Modern Day Meditation Guide Book, as e-book by Jim St. James. Exercises to help you realize the teachings. Inspiration to journal and contemplate. Personal support by Rose through email. Being part of discussion forum of people participating worldwide. Book your 6-week's Course Today! • 99Euro, this includes all materials, guided meditations and email/Skype support for the duration of the course. • Receive a 10Euro discount, if you write us a testimonial by the end of the course. How do we teach meditation? The truth is, nobody can teach you meditation. Meditation is something that you learn through practice. You can receive the teachings but it is you yourself that has to apply them, and as you are practicing you are learning from direct experience. You are teaching yourself in this way meditation. We guide the meditation course by explaining to you the mechanics of meditation. This was you can apply what you have learned into your own personalized practice. Rather then teaching you one particular technique from one spiritual direction, we go into the many different ways and techniques and how they all come together in one direction; going within. It does not matter how you do it, as long as you do it! You can do the course as it is set up as meditation for beginners, yet the teachings and guided meditations are excellent for the advanced meditator if you are looking for ways to further your practice. Why Should I do this Meditation Course? Well, very simply put, we have been guiding and supporting people in meditation successfully for a very long time. Meditation is a corner stone in our daily lives. It is what enables us to keep growing into more awareness and love. Meditation also allows us to contribute to others in a high qualitative way. It is most important for us that we walk our talk. Rose has a Phd and all, but really we like to think that our highest qualification for doing what we are doing is that we walk our talk. Rose started meditating 30 years ago, and starting teaching meditation 17 years ago. She is so passionately committed to you finding your way into meditation direct and straight. She is known for creating a space that is non-judgmental, open and deeply heartfelt. She brings in her connection to spirit in an inviting and non-religious way. People love listening to her voice as she guides you within. During the course you will also be listening to Jim St. James at times. Jim is one of Ian's and Rose's spiritual mentors and an incredible teacher of meditation. His way of explaining the process of going within is taking meditation out of the box and demystifies the practice. He is an expert on helping us with the traps of the mind. We even give you a "money back guarantee", so if you have followed our program and done your best, but are not happy, we'll give you your money back. We are happy to say that, if this happens, you will be the first!